I really enjoy teaching this lesson but it makes a content-heavy subject very easily understood. Students begin by breaking down a source using the OPVL method (origin, purpose, value, limitations) before proceeding to work through an extremely detailed set of notes. 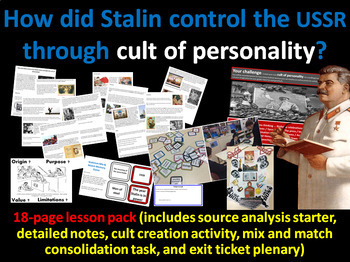 The class then use this information to create their own cults of personality before attempting a mix and match memory card game to test their comprehension. The lesson concludes with an exit ticket plenary.